Aspiring writers who place their hopes and dreams into the hands of fraudulent literary agents and publishing companies are often deceived into paying for an over-priced editing service, lied to about the qualifications of the editors, misled about the potential for acceptance by a publishing company, and ultimately rejected by fictitious literary agents or publishing houses. The dreams and aspirations of unpublished writers make them an easy mark, falling for half-truths and dubious incentives. A recent investigation of one company showed $10 million had been paid by 6000 would-be authors seeking help getting their manuscripts edited and published while another company was ordered to pay $5 million in restitution to 4000 writers who used the services of these so-called "vanity presses", "book doctors" or "literary agents", which are noted for charging up-front fees but never delivering on their promises of fame, fortune and notoriety. One company charged for this practice was Edit Ink out of Buffalo, N.Y.
A budding author, you see an advertisement for a company seeking manuscripts and are encouraged to send all (or a large part) of your manuscript to the company for review. The company then sends you a letter stating they have reviewed your work and that it is certainly marketable, as it shows "great promise and excellent commercial possibilities", but just requires some professional editing. They also send you a "joint venture" publishing contract, which upon your signing allows them to publish your book — at a cost to you of between $3,000 and $8,000 for such things as part of the publishing, layout or typesetting. This is commonly referred to as "vanity publishing." Some companies initially charge about $1300 to "edit" your book but then either ignore you or "refer" you to the next stage in the sham publishing cycle. The referrals are made in bad faith because your edited manuscript is still no closer to publication. This next stage "publishing" company expresses great interest in your literary masterpiece but declares that it needs yet more editing. They in turn charge $5 per page to provide the most rudimentary editing. From this they send 15% to the initial referral service which took your $1300. Soon you are deluged with an escalating schedule of reading fees, contract fees and marketing fees, all collected without any effort to actually agent your book in return. After resubmitting your edited writings to the original literary agent or publishing house, you are then informed that your manuscript has been rejected. Novice poets yearning to see their work in print will often take any opportunity to have their talent noticed. Not surprisingly, there are individuals who would like to take advantage of that eagerness and naiveté while reaping a tidy profit for themselves in the process. A Maryland firm that has garnered a national reputation for preying upon unsuspecting victims goes by the names the National Library of Poetry, the International Library of Poetry, the International Society of Poets, and the International Poetry Hall of Fame. In addition to providing press releases to the media, they also advertise poetry contests in many magazines as well as at their web site, www.poetry.com. The advertisements, press releases and web banners claim up to $58,000 in prizes will be awarded in the contests. After answering an ad in a magazine and submitting your poem, you are notified that your poem will be included in a special edition of their anthology. The carefully worded letter takes great pains to assure you that you do not have to make any purchases, yet goes on to list a host of available 'options'. Some of the options are: $20 to add your biography, $29 to have your poem read onto audio tape or $38 to have it mounted on a plaque. Wishing to show that there is no attention to the art of poetry or critical screening of submissions, humor columnist Dave Barry, journalists from The Philadelphia Inquirer, The New York Times, The Chicago Sun-Times, and Arnold Diaz of the ABC News program 20/20, have all submitted poetry to be considered by the ILP. The journalists involved entered poetry that was intentionally badly written and in the case of 20/20, the poems submitted were actually penned by a group of second-graders. In every instance, the poems were highly praised with the authors being offered the opportunity to purchase an anthology containing their poem at a "special pre-publication price" in the range of $40 to $50. Although ILP technically does publish the work as promised, the anthologies are available by subscription only. Because of the poor quality of most of the poems, anthology credits are not respected by legitimate publishing professionals. Sadly, many more people are taken in by this deception when local newspapers report on people's inclusion in the anthologies as if they were a genuine literary accomplishment. Most reputable publishers will pay the author if a submission is published. Smaller ones may not be able to afford paying writers, but will at the very least offer a free copy of the publication. I’m sorry you will be unable to join us at the 2002 International Society of Poets’ Summer Convention and Symposium in Washington, DC--the largest and most prestigious poetry event ever held. As you know, you were selected to be honored at this event, and we were looking forward to your presenting your poetic artistry in front of the more than 1900 poets from over 50 countries who will be attending. However, because we don’t want you to miss out on this unique opportunity altogether, we have arranged a way for you and your poetic accomplishments to be a part of this event in a major way, without your actually being present. Although you will be unable to participate in the Convention contest (you must be present to win), you can receive all of the awards we have scheduled for you--including your custom engraved International Poet of Merit Silver Award Bowl, your bronze Commemorative Award Medallion, and your Full One Year Membership into the International Society of Poets for 2002-2003--if you will allow us to present one of your poems at the convention in your place. We have arranged for professional poetry reader Alan Rose to read your poem at this largest gathering of poets in history. Mr. Rose’s dramatic baritone voice and imaginative style will give your poetry a dynamic flair, as well as the worldwide exposure and recognition that it deserves. Your poem will also be featured in printed form, proudly displayed in a special room at the convention that will be accessible to more than 2500 attending poets and guests. -- Your International Poet of Merit Silver Award Bowl (a $175.00 value) is a magnificent work of art in itself that measures over 10 inches across and over 10 inches high. It is handcrafted in silver and has your name custom-engraved on a beautiful cherry wood base. It is certain to enjoy a special place of pride in your home and will serve as a fitting symbol of your unique poetic artistry. -- Your bronze Commemorative Award Medallion (a $40.00 value) is a deeply etched bronze medal brilliantly displayed on a 25 inch red, white and blue satin ribbon. -- And your Full One Year Membership into the International Society of Poets for 2002-2003 (a $60.00 value) entitles you to a personalized membership card, an ISP patch and decal, entry into special contests during the year, and a subscription to The Poet's Corner quarterly magazine. All that’s required for us to immediately send you all of these Awards is for you to submit a poem to be formally presented at the convention. Additionally, we must also ask you for the necessary funds ($169.00) to cover the costs of the time and effort required to present your poem before the convention attendees both aloud and in writing, as well as the costs incurred in insuring and shipping to you these extremely bulky and heavy awards. We are, of course, ultimately most interested in meeting you and having you personally present your artistry in front of the thousands of other poets who attend these live events. Unfortunately, this is not to be the case at this time, so we’re trying to do the next best thing. But we sincerely hope to personally present you with your most deserved awards in the future. P.S. Your International Poet of Merit Award and bronze Commemorative Award Medallion will be shipped to you by Federal Express, and will be accompanied by an iron-clad promise that you will be thrilled with your awards. If for any reason you’re not completely delighted, simply return them any time within 60 days of receipt for a full refund, no questions asked. P.P.S. You'll also receive a $100.00 gift certificate off the registration of a future ISP convention so that we can formally recognize your poetic accomplishments in person at a date that's convenient to you. A Consulting Editor for Tor Books sends along her comments and experiences May 22, 2001. 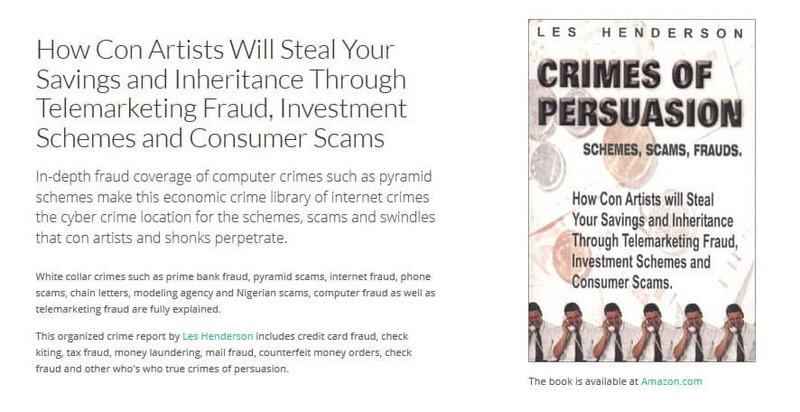 Here are a couple of publishing-related scams not mentioned in your phylogeny. 1. Display sites. These web-based operations charge would-be authors a fee to display part or all of their unsold novels, usually for some limited amount of time, under the representation that editors looking for new writers will come to the site, read their work, and wind up buying their books. Speaking as an editor, I can tell you there's no way that's going to happen. It's all we can do to keep up with the conventional manuscript submissions. We don't spend our time surfing the web in search of more slush. 2. Coupons for review copies. A bunch of spammers in Georgia were working this one hard a couple of years ago. The deal was that you'd pay them -- I think it was thirty or forty dollars, but I can't remember -- and in return would get three coupons you could send to any publisher to request a "review copy" of any book you wanted. There was a fairly elaborate further setup whereby you'd post your reviews to the scammers' site. In theory, newspaper and magazine editors with too much time on their hands and a crying need for amateur book reviews (a very unlikely scenario) would find them there, pay to publish them, and you'd receive "royalties". However, that was all window dressing. The heart of the scam was buying these coupons you could swap for books. Needless to say, nobody in the publishing industry had ever heard of these scammers or their coupons. Occasionally a publicity department that was running on automatic would send someone a copy of a book they'd requested, but the coupon had nothing to do with that, aside from its confusion value. I've since heard from a friend who tracks frauds that the scammers who thought this one up were expanding into coupons for would-be reviewers of restaurants, resorts, music and videotapes, and computer hardware and software, but I haven't gotten any more spam from them so I don't know. For more on this type of scam visit her Weblog and Victoria Strauss' Writer Beware section. Today’s Woman Writers Warning dedicated to providing warnings of possible scams or contests to avoid.